I first became familiar with Neal’s Yard Remedies when I picked up their hand creams as magazine freebies. I love them, but I hadn’t really looked into any other NYR products until recently. This is a shame, because they have a lovely selection. Curious? Here’s what I’ve been loving. I had to start with this. The scent is garden mint as opposed to peppermint, so maybe it’s more suited to spring and summer, but I’ve been using it anyway. My hands get cracked and dry as soon as the weather turns cold, but a generous layer of this before bed calms them right down. First of all, can we take a moment to admire the packaging? I think the navy and blue colour combination is so chic. This is shampoo is a bit different to most products for fine hair, because it moisturises the hair as well as adding volume. It doesn’t lather up much, but it’s easy to work through the hair, rinses out well, and is very kind to the scalp. A new favourite. This lotion is thick. It takes a lot of time to work it into the skin, and even longer for it to sink in. But here’s the thing: it works. My skin is always ridiculously soft when I’ve used it, to the point where other people have noticed (I got dragged into a ‘feel my biceps’ conversation and while my biceps aren’t anything special, apparently the skin that covers them is). The lotion smells very sweet and fruity, thanks to the orange and mandarin essential oils. NYR are donating £10,000 a year from sales of this range to projects that will help to save bees, so if you buy it you’ll be helping out a worthwhile cause. I wanted a silicone-free hair treatment and this one fit the bill: it’s simply made up of lots of different oils. I use it overnight and then wash it out the next morning when I’m not in a rush to be anywhere. It takes forever, but when my hair dries it feels very silky and soft, and looks less frizzy. The treatment doesn’t make enough of a difference for me to call it a miracle worker, but it’s still good. Just make sure you have plenty of time on your hands if you’re going to use it. 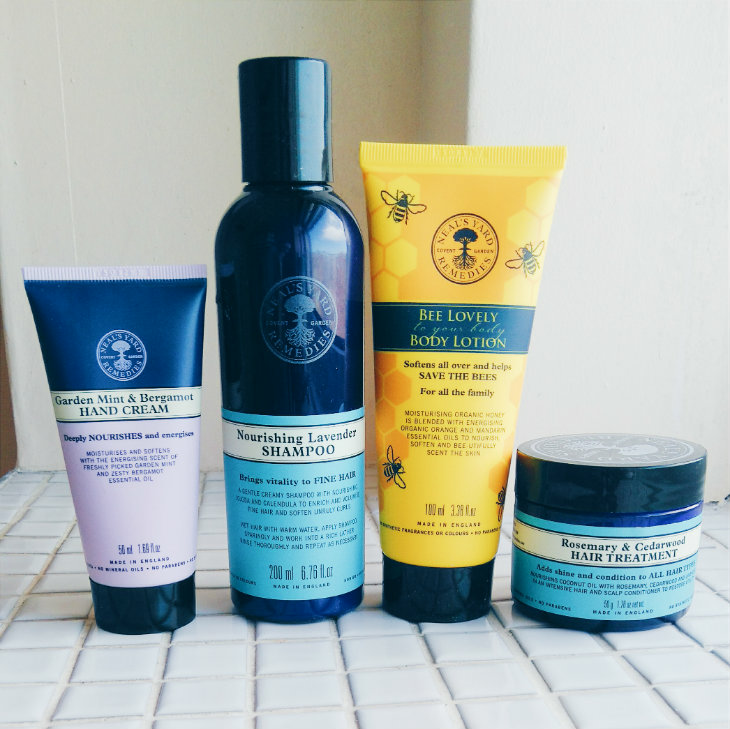 Have you tried anything from Neal’s Yard Remedies before? Let me know.